There are enough studies proving the benefits of meditation to individuals in improving the quality of life. We have witnessed many times how a handful of people strongly unified by a common intent can profoundly influence a larger group of people. Great global movements for peace, from Martin Luther King Jr. to Mahatma Gandhi, have always begun with a coming together of people who want peace for the greater good. 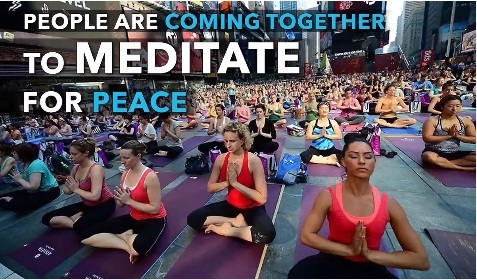 People are coming together to meditate for peace. In September of 2012, 248 groups around the world unified on the international day of peace. The next year 564 cities participated doubling the number of cities in 2012. By last year 1,417 communities unified with one voice. This year there is an unprecedented wave of momentum building, as we also join with the 20th anniversary of EarthDance. The Global Peace Party. Join us on September 24th at 04:00 pm pacific, 11:00 pm GMT around the world. Meditate for peace, join a local event, or just join in wherever you are. Be the peace you want to see in the world. Register free at peace.unify.org . 1. We are all ONE! There are studies that prove the existence of a ripple effect of peace in surrounding environment when a group meditates together. 2. There is Power In Numbers There are many scientific researches that have shown extremely positive social, political and economic results correlated to synchronized group meditations. Let’s join the Peace Synchrony! Share with you friends and family this great upcoming event!